For some easy pom-pom pumpkins, grab some orange yarn and a few green pipe cleaners. Place the end of your yarn between two of your fingers and wrap the yarn around three of them to create an “oval” shape. 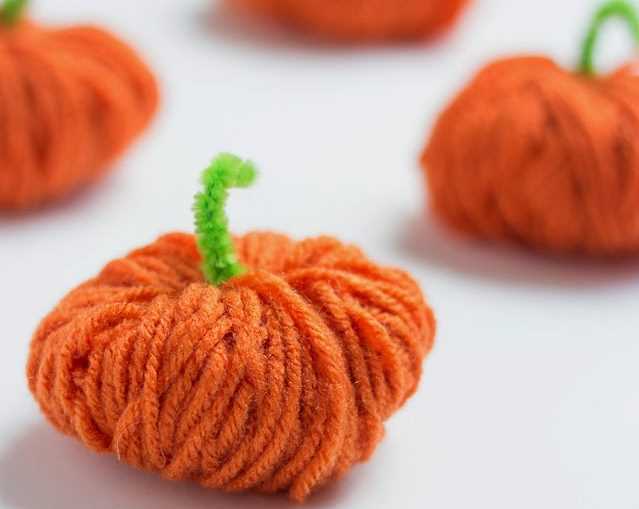 Once your pumpkin is thick enough, end with a wrap of yarn down the center of the bunch and tie it in a knot. Slip the pumpkin off of your fingers and cut a small piece of pipe cleaner for the stem. Create a playful garland using just felt, a large sewing needle, and some yarn or embroidery thread. Gather up sheets of felt in fall colors like red, orange, yellow, and brown and cut out leaves as large as you’d like them (and in any or several leaf shapes you want). After that, thread your needle with your yarn or thread and sew a few in-and-out stitches from one end of the leaf to the other. Continue stringing the leaves together until you have a finished garland. All you need for this festive pumpkin is a roll of toilet paper, some hot glue, and some twine! Starting on the inside of the toilet paper, use hot glue to glue down one end of your twine. Wrap the twine around the toilet paper a few times, then move to the opposite side of the roll and repeat. Continue to wrap the roll in sections, eventually overlapping the twine to create a rustic look. Finish the pumpkin by placing a stick in the center hole. One of the easiest homemade wreaths to create is a yarn-wrapped wreath. Simply choose your favorite color (or multiple colors) of yarn and begin by gluing one end to the inside of your foam wreath. Continuously wrap the yarn around the wreath (either in straight lines or in several directions) until all of the foam is covered. Finish with a fabric bow, some hand-made rosettes, or any other festive accent to complete your wreath. Wooden string art is perhaps the most versatile craft you can create. Start with a piece of wood in any shape or size and gather up some thin nails. Outline a word, picture, pattern, or anything else you’d like to create, then hammer in your nails about an inch apart along the outer edge of the design. Pick out some creative embroidery thread colors and tie one end around a nail. From there, criss-cross your thread across the design and around the other nails until it’s filled in as much as you’d like. Add different colors for different accents and once you’re done, tie the last piece off on the last nail. If you have a bit of time on your hands, you can give a plastic craft pumpkin a beautiful rosette design with some twine and some glue. Place a dot of glue at the end of your twine and begin wrapping the twine around itself to create a rosette. Create as many as rosettes as you need (in various sizes) to cover your pumpkin and let dry. Then, glue them onto your pumpkin to create an elegant centerpiece. All you’ll need for this craft is white, orange, and yellow yarn as well as some hot glue and several styrofoam cones. Starting at the bottom of the cone, glue the end of your yellow yarn to the underside of the cone and begin wrapping it around it. Once you get about 1/3 of the way up, switch to orange yarn and after another 1/3rd, switch to white to finish the candy corn. Grab a few wooden letters to spell out a festive word like “autumn”, “fall”, “Halloween”, or even something like “love” or “peace”. Next, choose embroidery thread in few of your favorite fall colors and using the same method as the yarn wreath, wrap your wooden letters in your thread. Once you’re finished, you can cut out some festive fall items (like leaves or acorns) from felt and glue them onto the letters. Then, set them on your mantle or hang them on your wall. Gather up a balloon, some orange or yellow string, and some regular white glue. Blow up the balloon to the size of the pumpkin that you would like and tie a piece of string to the knot. Hang the balloon from a cabinet handle, then dip the rest of your string into the glue to coat it. Wrap the string around the balloon as many times as you’d like and hang to dry. Once dry, pop the balloon, pull it out, and add a piece of green or brown pipe cleaner for the stem. For a fun craft that your kids can do, grab some popsicle sticks, white string, and a few plastic spiders. Place a dot of glue in the middle of three popsicle sticks, then layer them on top of each other to form a star shape and let dry. Starting about 1/4″ down on one popsicle stick, glue the end of your white string and loop the string around the adjacent stick. Continue onto the next stick, all the way around, and repeat just a little lower each time until the entire design is webbed. Glue your plastic spider onto the web as a finishing touch. This entry was posted in DIY and tagged crafts, DIY, fall, string, thread, yarn.